Here are the materials shared with the public, minus the resolutions. No proposed rules (items 10 through 17 on the agenda) were shared. Here is the Ustream video: Part 1 and Part 2. Obviously, there was lots to discuss. Three hours worth, in fact. Here is the Storify version of the work session, which is a compilation of any information I shared during the work session via Twitter, plus information tweeted out by others. I must admit that there are just times when I simply cannot get all of it written up in a timely manner. Storify hits the high points. The next meeting is a combined work session and board meeting and is set for July 9. If you have any questions, please contact me at asc(at)alabamaschoolconnection.org, or comment on the ASC facebook page. When you hear all of the changes the state board of education is entertaining, your head will start spinning. It all sounds so good while you’re sitting there listening to it. It’s obvious that Children have taken center stage under Dr. Tommy Bice’s superintendency. How he proposes to greatly improve public education for our children is remarkable. Bice doesn’t propose to reinvent the wheel; rather he appears to draw on models either already in existence or on laws that are already on the books that haven’t been enforced. Today’s post contains two versions: The Short Version and The Details. The State Board of Education met on Thursday, September 27. The meeting began around 10:40 a.m. All board members were present except for Mrs. Betty Peters. Officials have included monies for Technology, Library Enhancement, Professional Development and Common Purchases in the FY14 draft budget (all of those categories have been zeroed out for a few years now). Library support positions will be decreased by 346.75 positions in the FY14 budget. 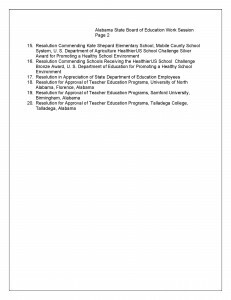 Details of how the Alabama Administrative Code will be updated to reflect the needed changes due to the implementation of the School Board Governance Improvement Act were presented. Returning Other Current Expense to the 2008 level. Increasing the amount for textbooks to $75 per student in the FY14 draft budget. Granting a cost of living salary increase to employees. The Guaranteed Graduate concept, meaning that every student who graduates will be prepared to either start a career or attend and succeed in college. Better supporting teachers through a number of methods including scholarship offers for the best recruits, implementing a mentoring program for first- and second-year teachers, and opening up pathways for teachers to rise to higher levels within their profession, not only through becoming an administrator. Issue $30 million in bonds for Career and Technical Education (CTE) to improve offerings in schools willing to apply for monies. Implement a state recognition, accountability and support program for schools and school systems in accordance with recently passed legislation. Form a coalition of state agencies to support children and families. Provide $5 million in funding for Arts Education through an application process for school systems. Fund Alabama’s nationally-recognized PreK program to enable more voluntary participation. Continue to explore more equitable ways to distribute state funding based on need. NOTE: My apologies for not having this completed earlier. A range of personal circumstances conspired to keep my away from my duties. 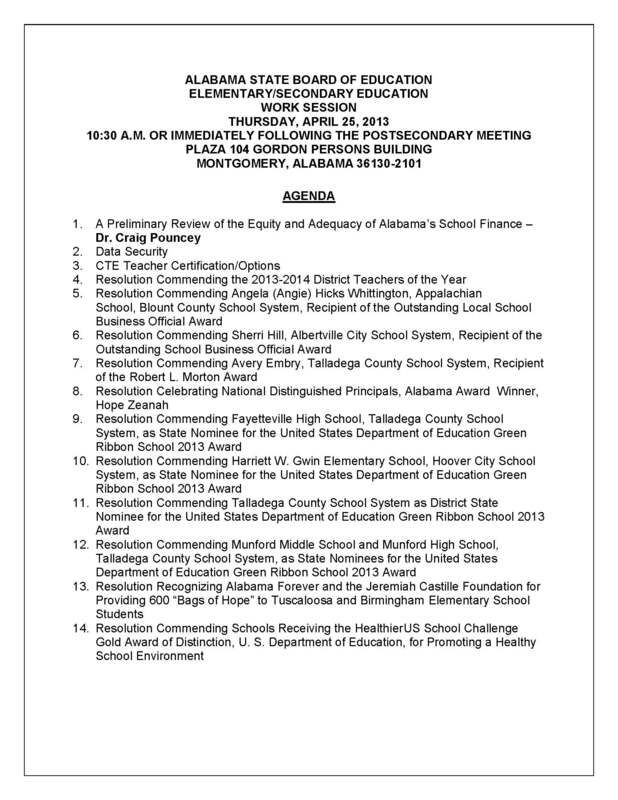 Even though the Birmingham board is set to vote today on the financial plan required by the state department of education, the discussion at the finance committee meeting is relevant. 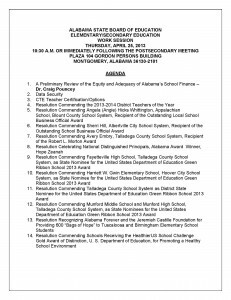 While this is obviously a local issue to Birmingham, Alabama, the whole idea of using committees to conduct the work of a board of education is not a widely accepted practice among Alabama’s school systems. 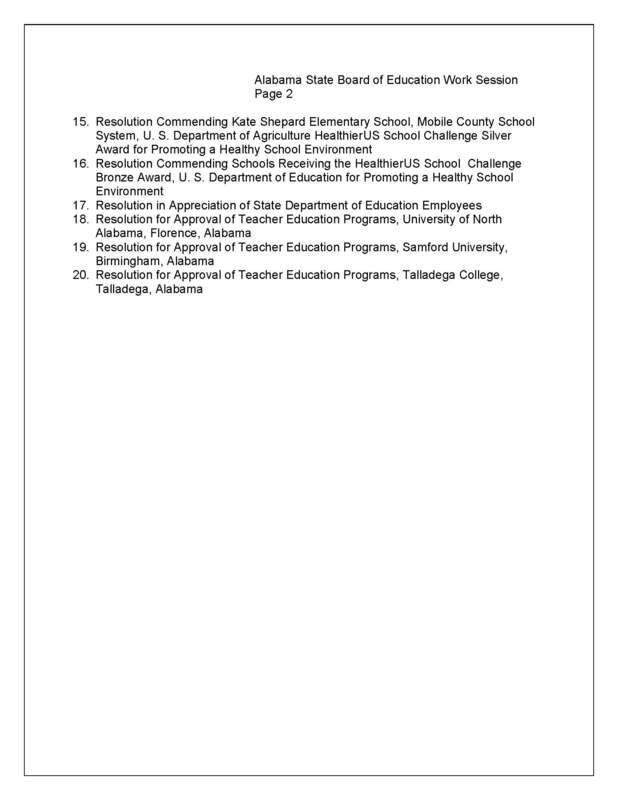 Birmingham’s Board of Education utilizes standing committees which meet on a regular basis. Chairmanship of the committee rotates among board members. Ad hoc committees are also in use. This was the first committee meeting of any type for the Birmingham Board of Education that I have attended. Four board members were in attendance: Virginia Volker, April Williams, Brian Giattina, and Emanuel Ford. Mr. Ford is Chair of the committee. Mr. Giattina was previously the Chair.